There are 8 words – 8! – in that title so by the standards of internet food, you can be certain of one of two things: it’s either complete and utter garbage or it’s totally amazing. I don’t have the time or the budget to blow on complete and utter garbage. Add a grilled pineapple margarita and take your plates to the back patio and you’ve got dinner perfection. Because as a native Texan, I know we only get 11 of these picture-perfect beautiful evenings a year before Mother Nature realizes she’s being too nice and fires up the broiler and unleashes the Hell-Hound Mosquitos. 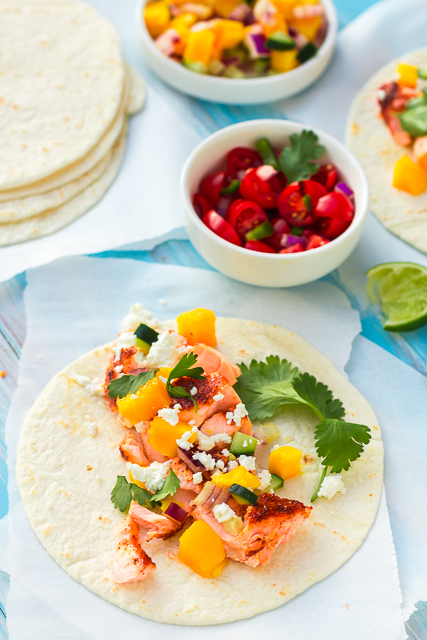 Dry-rubbed salmon is broiled and then glazed with honey and lime before being topped with a fresh salsa and wrapped in a tortilla. Preheat the broiler and move the top rack to ~4-5 inches below element. Mix dried ingredients in a small bowl. In another small bowl, mix honey and lime juice together (a 10-second trip through the microwave is helpful). Line a pan with foil and lightly brush with olive oil or cooking spray. Place salmon on foil and drizzle with olive oil. Sprinkle the spices over the top of the salmon, rubbing over the top and sides of the fish. Broil for 5 minutes, brush with half of the honey mixture, and broil 1 more minute. Brush with remaining honey mixture and broil 1 minute. 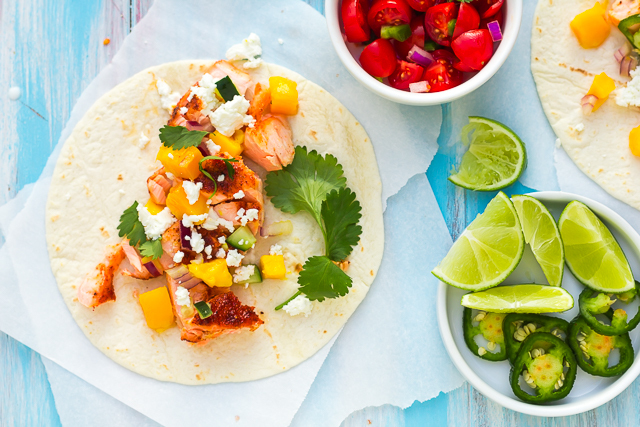 While the fish is cooking, toss the diced mango, cucumber, red onion, jalapeno, cilantro, and a pinch of salt together in a bowl. Squeeze 1-2 lime wedges over top. Remove the fish from oven and let sit 5 minutes before flaking with a fork and assembling as tacos. 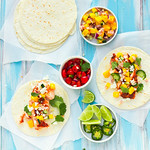 Serve topped with a generous scoop of salsa, crumbled goat cheese, and additional lime wedges on the side. I don’t eat salmon often as I am not the biggest fan of seafood but I may need to make an exception for these!